Maintaining positive behavior in a classroom is one of the most important things teachers can do to enhance student learning. Early in my career, I developed a system for rewarding positive behavior that I have used successfully for 12 years. My students know what it means to be responsible, respectful, and focused, and they work hard to exhibit these behaviors. The Colors of Success positive discipline system simultaneously rewards students for positive behavior, discourages negative behavior, and teaches the behaviors that help people become successful. 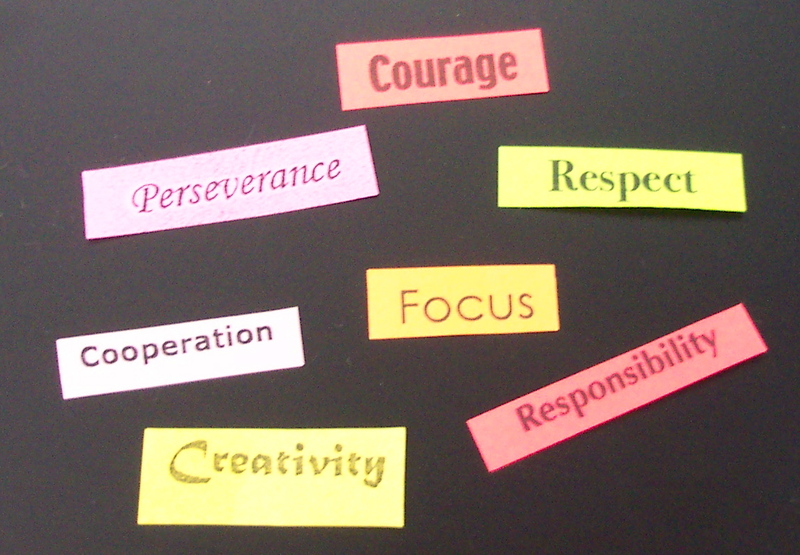 I have little color-coded slips of paper labeled with the following virtues: Cooperation, Creativity, Courage, Focus, Respect, Responsibility, and Perseverance. I give these slips out liberally to deserving students. For example, students who quickly get to work after instructions are given could receive Focus slips. Students with the appropriate materials could receive Responsibility slips. A student who makes a presentation could receive a Courage slip. Students working well together could receive Cooperation slips. To affect whole-class discipline, I announce that I am “looking for focus,” or “I’ll be seeing who is responsible by taking notes during the film.” or “Responsible students have already written down their assignment.” or “Respectful students don’t talk during the morning announcements.” etc. So, while students are engaging in positive behaviors, they are learning the appropriate vocabulary associated with that behavior. Students who are not receiving slips are seeing their classmates being rewarded for Responsibility, or Focus, or Cooperation. To add an additional carrot, I give out rewards and prizes from time to time, or take kids out to lunch based on whether they are earning the behavior slips. I believe this combination of an extrinsic reward, with instruction about positive behavior establishes a classroom environment where students learn and practice good habits. As I teach these virtues, throughout my courses, I frame my discussion within the context of how they help one live a successful life; in education, in careers, and in relationships. Cooperation: Being able to work together to solve problems and accomplish tasks. Students share ideas, listen to each others’ ideas, create a plan, and divide the work. Courage: Having the will and confidence to be able to do that which is difficult, challenging, or unpopular. Students can get in front of a group of people and present ideas. Creativity: The ability to create new works or ideas. Students can share questions, ideas, and hypotheses in class. They solve problems in their own way. Focus: The ability to concentrate on the tasks that are required. Students quickly move from one lesson to another. They listen to instructions the first time, and follow them precisely. Perseverance: The ability to keep working on a task. Students do not quit, do not pack up early, even when the work is difficult, and even if others do quit. Responsibility: The ability to do what you are supposed to do, even without direct instruction. Students have all of their materials and work. They follow all the rules, and do not wait to be told what to do. Respect: Treating people and things with dignity. Students take care of all materials, use appropriate manners, and are especially kind to guests in the classroom. Not so long ago, I wrote a blog entry blasting the concept of running schools like businesses, In which I speculated about the kinds of harmful effects that would result if we increased the influence of the private sector on public education. While I believe that the stability and integrity of education relies on it’s separation from the free market, I also believe that public education of all kinds must prepare students for the world of work, and the myriad opportunities for employment and continuing education. After all, what would the state of our economy be if we didn’t have… never mind. Many strategies of classroom management emphasize extrinsic rewards. Most common of these are the negative warnings, threats, and consequences established to deter negative behavior. Name on the board, putting one’s card on a different color, checks, conduct marks, discipline referrals, being sent to the principal’s office, and detention all fit this category. These sorts of measures are necessary in some form, though when the punishment doesn’t fit the crime, or the penalty doesn’t clearly identify the crime, students can find themselves unable to distinguish the negative behavior from anything else. These deterrences work best when students are instructed about why their behavior was unacceptable, and what they could do differently. Teachers cannot allow negative behaviors to persist in a classroom unchecked. Doing so is a disservice to all students. Without consequences, negative behaviors will persist. Because of the distasteful nature of becoming a behavior cop, teachers, especially of younger students, turn to methods that reinforce positive behaviors, to turn the focus away from the negatives. These methods can turn the classroom setting into a microcosm of capitalism, where students are motivated by greed and selfishness. Kids are rewarded with stickers, smily faces, marbles in a jar, grades, and various other incentives. There are some benefits to these extrinsic rewards, and they can produce immediate positive results for teachers. They can also lead one down the slippery slope where students see their work and behavior only as a means to an end, and that end being some kind of payment. An effective classroom management and discipline system needs to do more than reward students for their present behavior. It needs to instill positive behaviors that will persist, and become part of an individual’s lifelong patterns of behavior. Learning behaviors that are universally transferable, and don’t rely exclusively on the presence of a unique reward system, will enable success in a variety of social, intellectual, and employment situations. How do you combine the need for social-behavioral lessons facilitated by a teacher in order to positively influence current classroom behavior, with the greater goal of providing life-long behavioral skills? How do you make this system manageable and facile? I take a hybrid approach, that I call the Colors of Success (.pdf). I invented this system during my first year of teaching, culling together things I had learned about character development and classroom discipline. The Colors of Success positive discipline system simultaneously rewards students for positive behavior, discourages negative behavior, and teaches all students the behaviors that help people become successful. I have little color-coded slips of paper labeled with the following virtues: Cooperation, Creativity, Courage, Focus, Respect, Responsibility, and Perseverance. I give these slips out liberally to deserving students. For example, students who quickly get to work after instructions are given could receive Focus slips. Students with the appropriate materials could receive Responsibility slips. A student who makes a presentation could receive a Courage slip. Students working well together could receive Cooperation slips. We teachers often reference the end products of education as reasons for engaging in a particular activity: “If you don’t learn how to divide fractions, you’ll wind up flipping burgers.” “You can’t get into college without passing your lab science courses.” Less often, we discuss how one would keep a given job, or continue success in higher education. For years, in my motivational discussions with students I would frame the future in terms of these artificial, ‘one-time’ moments: graduating, going to college, and getting a job. Life is a lot more than getting a job or attaining any specific milestone. College success is certainly much more difficult than admission (at least in non- ivy league schools). While you would want students, on their own, to be intrinsically motivated to be respectful, responsible, and focused, some students still need additional context to make it worthwhile. For these students, often the promise of graduating from high school or getting into college can be too obscure to be a motivating factor. But making money, and keeping a job, these are things that I find (my) students tune into. Considering the demographics of my teaching situation, where nearly all students are from low-income, often agricultural, migrant, low-education backgrounds, the concept of stable employment strikes a chord. Keeping employment, and the stability associated with maintaining income, are real struggles for the families of my students. Recently, in my junior high classroom, I have taken to describing classroom situations, from time to time, in the context of, “What if I was your boss, and you were my employee, and the work you are doing is the work that earns your pay?” I’ve learned that this kind of dialog can really transform the situation, so that students may be more likely to engage in deliberate behavior. For some students, the teacher-student relationship is one they may have become (too) comfortable with. The consequences for failure to complete work or disrupting class really aren’t all that bad for some kids. Detention and low grades can be little more than annoyances. Not being in good graces with the teacher can have little or no bearing on their all important social status. However, a new degree of seriousness can arise when the classroom situation is transformed into a role-play of the employee-supervisor relationship, where the teacher is not just as the authority figure, but is someone on whom your livelihood actually depends. The point is to take away the sense of “fake-world-ness” of the classroom, and to bring a sense of applicability to lessons. •The kind of reading you are doing right now is similar to how you might read a technical manual as an electrician or mechanic. •If I was your boss and gave you a week to complete a job, like your homework assignment, what would happen, if at the end of the week, you had nothing? •Your superiors make decisions about your career, your pay, promotions, or other opportunities. You want to make a good impression on those superiors, you don’t want to embarrass yourself or insult someone. •Any kind of high-paying position will require you to understand complex ideas and complex procedures. Therefore, anytime you are learning anything, it is practice for understanding your future job skills. •Using computers and the internet to find information is practice for any career or college major. •Think about the quality of your homework like the quality of a craftsman. You are making a product that you can sell, and the quality of the work determines how much you will be paid.